As a post-pubescent member of the male gender, I can’t say that I’ve gone through a certain biological process that has been discussed only in hushed whispers, bouncing from ear to ear, until it died out within the echoes of household gossip. However, a new dawn brings a new day, and now, menopause is a widely discussed ‘phenomenon’ and not a ‘disease’ that is simply swept under the rug. But I can sympathize with the hundreds of millions of women around the globe that are undergoing this natural change because I’ve seen it happen all around me! From my mother having problems sleeping at night to ‘Baa’, the domestic helper who has been with my family for years, claiming that she was burning up, even in an air-conditioned room; I’ve noticed most of the significant female influences in my life go through this process and come out stronger than they ever were – and so can you. Menopause has a significant incubation period, known traditionally as “perimenopause”, stretching anywhere from months to years; and has some tell-tale symptoms ranging from irregular periods to thinning hair and dry skin. And while Hormone Replacement Therapy or HRT may have been standard operating procedure to combat these symptoms in the past, modern medicine focuses on replenishing the crucial vitamin reserves that are depleted with age and a lack of estrogen. Sounds simple enough, just supplement the lack of vitamins with pills and keep the nasty symptoms at bay, right? Wrong. The constantly evolving world of clinical trials and studies has provided us with numerous evidence that simply popping pills to replace the lost vitamins may well worsen the situation. For instance, a 2002 study found that high levels of factory made vitamin A caused a higher likelihood of hip fractures in its recipients, although vitamin A obtained from natural sources didn’t appear to pose the same risk. The answer? Shove aside the pharmaceuticals, and pick up the nutraceuticals. Nutraceuticals are a wave of health products that are obtained from naturally occurring food sources, and luckily India is seeing the launch of a first-of-its-kind nutraceutical supplement formulated specifically for the menopausal women of this nation. 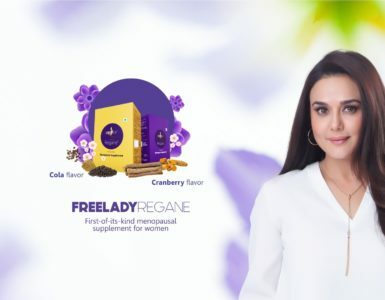 FreeladyRegane is chock full of naturally sourced multivitamins and multi-minerals and is now available for purchase on Amazon and the MyFreeLady webpage. So, now instead of swallowing a deluge of pills every morning, just a sachet a day keeps the symptoms away!